Manchester Organics in partnership with OmegaChem have developed and commercialised a new safer and crystalline fluorinating reagent. In the past, organic chemists needed DAST, Deoxo-Fluor® and more recently Fluolead® to perform fluorination, but XtalFluor® reagents come today with a long list of advantages over all of them. 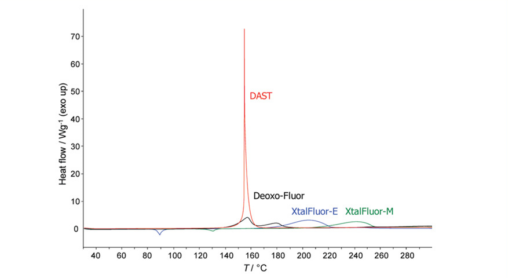 Overlapped DSC thermograms indicate that XtalFluor® reagents are more stable and provide greater safety than DAST and Deoxo-Fluor® by showing a higher decomposition temperature and a lower exothermic heat. In depth analyses of overlapped ARC thermograms clearly show higher onset temperatures for XtalFluor® reagents. 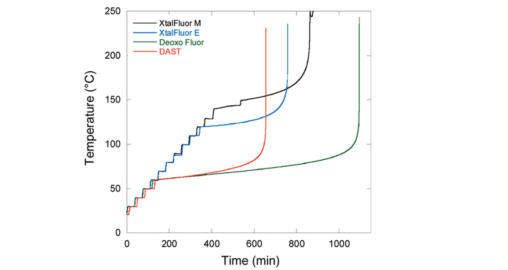 Whereas DAST and Deoxo-Fluor® show an onset of self accelerated decomposition at 60°C, XtalFluor-E® and XtalFluor-M® start decomposing at much higher temperatures, i.e. 119°C and 141°C respectively. Using XtalFluor® reagents allows the chemist to vary several reaction conditions, such as the nature of the reagent, temperature, additives and stoichiometry to obtain optimal results. Research quantities available through Sigma-Aldrich Co.
XtalFluor-E® and XtalFluor-M® are registered trademarks of OmegaChem, Inc. 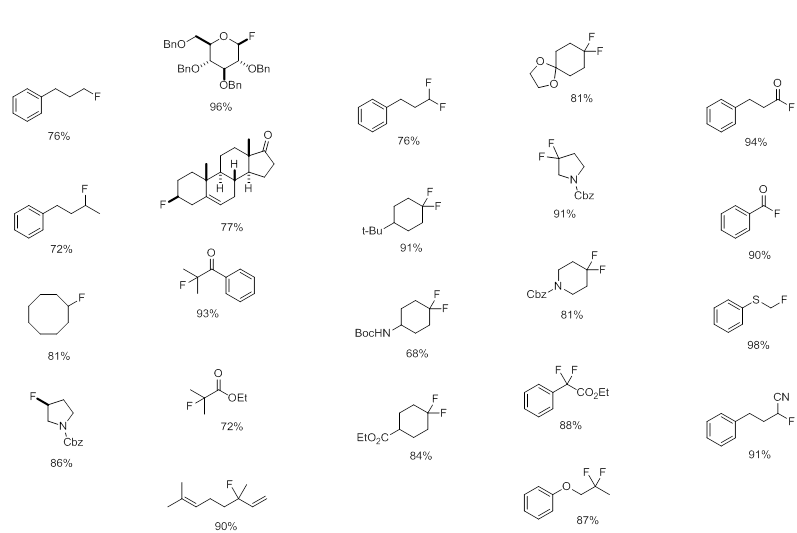 Since the discovery in 2009 of new crystalline fluorinating reagents, the following scientific papers have been published. These publications should allow a full understanding of their benefits over DAST, Deoxo-Fluor® and Fluolead™. A provisional US Patent Application has been filled along with Trademarks for XtalFluor-E® and XtalFluor-M®. Nonn M., Kiss L., Haukka M., Fustero S., Fülöp F. Org. Lett. DOI: 10.1021/acs.orglett.5b00182..
Brandstatter M., Roth F., Luedtke N.W., J. Org. Chem. 80(1), 40-51 (2015)..
Desroches J., Champagne P.A., Benhassine, Y., Paquin J.-F. Org. Biomol. Chem., 2015,13, 2243..
Keita M., Vandamme M., Mahé O., Paquin J.-F. Tetrahedron Lett. 56(2), 461-464 (2015)..
Turcotte-Savard M-.O., Mahé O., Paquin J.-F. Chimica Oggi-Chemistry Today, 31 (4), 14-19 (2013)..
Mahé O., Desroches J., Paquin J.-F. Eur. J. Org. Chem. (2013), 4325-4331..
Orliac A., Gomez P. D., Bombrun A., Cossy J. Org. Lett. 15(4), 902-905 (2013)..
Mahé, O.; L'Heureux, A.; Couturier, M.; Bennett, C.; Clayton, S.; Tovell, D.; Beaulieu, F.; Paquin, J.-F. J. Fluorine Chem. 153, 57-60 (2013)..
Franconetti A., Synlett, 24(7), 891-892 (2013). Bennett, C.; Clayton,S. ; Tovell, D. (2010). C&I Magazine. Issue 17. September 13, 2012. Olivier Mahe, Alexandre L’Heureux, Michel Couturier, Christopher Bennett, Simon Clayton, David Tovell, Francis Beaulieu, Jean-Francois Paquin. Pouliot M.-F., Angers L., Hamel J.-D., Paquin J.-F. Tetrahedron Lett. 53(32), 4121-4123 (2012). Pouliot M.-F., Angers L., Hamel J.-D., Paquin J.-F. Org. Biomol. Chem. 10(5), 988-993 (2012). This article is available for free through the ACS AuthorChoice Program. Beaulieu, F.; Beauregard, L.-P.; Courchesne, G.; Couturier, M.; LaFlamme, F.; L'Heureux, A. Org. Lett. 2009, 11, 5052-5053. Since their introduction on the market in 2009, several articles have been published about the XtalFluor-E® and XtalFluor-M®. These new reagents have already retained the attention among the scientific community due to their potential in the fluorination industry. XtalFluor® Salts are once again among the recent Highlights from the Literature in the latest published issue of Organic Process Research & Development. This article is available online through the ACS Publications. ChemFiles is a FREE quarterly newsletter written by Sigma-Aldrich experts within their Product Management and R&D team. XtalFluor® Deoxofluorination Reagent makes the cover page of their recent newsletter in addition to being among the latest products presented by these experts. Ryba,T. (2010). Aldrich ChemFiles. Volume 10, Number 3. Synthetic Reagents. XtalFluor-E® and XtalFluor-M®: Convenient, Crystalline Deoxofluorination Reagents. C&I Magazine has recently published an article entitled "Simple fluorine chemistry" as cover story in their September 13th issue. This article describes the partnership between OmegaChem, Manchester Organics and Sigma-Aldrich in the development of the newXtalFluor® fluorinating reagents that put safety first and deliver results. Bennett, C.; Clayton,S. ; Tovell, D. (2010). C&I Magazine. Cover Story. Issue 17. September 13, 2012. Simple fluorine chemistry. In this publication, the new XtalFluor® Reagents with Enhanced Thermal Stability and Ease of Handling are among the recent Highlights from the Literature. McLaughlin, M; Rubio, S. G.; Wilson, I.; Zhao, W.; Laird, T.; Zlota, A. Org. Process Res. Dev. 2010, ASAP. The benefits XtalFluor® Reagents are highlighted in an article available online through the ACS website. American Chemical Society. (2010). Noteworthy Chemistry. June 7, 2010. Aminodifluorosulfinium salts are improved fluorination reagents. In these articles written by several authors, XtalFluor-E®andXtalFluor-M® are among the Green Chemistry Highlights. Andrews, I.; Cui, J.; Dudin, L.; Dunn, P.; Hayler, J.; Hinkley, B.; Hughes, D.; Kaptein, B.; Lorenz, K.; Mathew, S.; Rammeloo, T.; Wang, L.; Wells, A.; White, D. T. Org. Process Res. Dev. 2010, 14, 770. These articles can be accessed online through ACS Publications. The multiple benefits of XtalFluor® Reagents for the pharmaceutical and agrochemical industries have been first reported in an article written by Stephen K. Ritter on the C&EN website. Ritter, K. S. (2010). Chemical & Engineering News. Latest News. April 28, 2010. Deoxofluorination Reagents Proliferate. Scientific Update was the first to cover the XtalFluor® reagents discovery in November 2009. Scientific Update (2009). NewDeoxofluorination Reagent. Issue 32, November 2009. To a cold solution of triethylamine trihydrofluoride (2.0 mmol) in CH2Cl2 (3.0 ml) is added XtalFluor-E® or XtalFluor –M® (1.5 mmol) followed by the substrate (1.0 mmol). After 30 min of stirring under nitrogen, the reaction mixture is allowed to warm to room temperature. Upon reaction completion, the reaction mixture is quenched at room temperature with a 5% aqueous NaHCO3 solution, stirred for 15 min, and the resulting mixture is extracted twice using CH2Cl2. The organic phases are combined, dried over MgSO4 and filtered. Solvents are evaporated and the resulting crude material is purified by standard methods. To a cold solution of triethylamine trihydrofluoride (2.0 mmol) and triethylamine (1.0 mmol) in CH2Cl2 (3.0 ml) is added XtalFluor-E® or XtalFluor –M® (1.5 mmol) followed by the substrate (1.0 mmol). After 30 min of stirring under nitrogen, the reaction mixture is allowed to warm to room temperature. Upon reaction completion, the reaction mixture is quenched at room temperature with a 5% aqueous NaHCO3 solution, stirred for 15 min, and the resulting mixture is extracted twice using CH2Cl2 . The organic phases are combined, dried over MgSO4 and filtered. Solvents are evaporated and the resulting crude material is purified by standard methods. To a solution of triethylamine trihydrofluoride (1.0 mmol) in 1,2-dichloroethane (2.0 ml) are added XtalFluor-E® or XtalFluor-M® (1.5 mmol) followed by the substrate (1.0 mmol), and the reaction mixture is heated to reflux. Upon reaction completion, the reaction mixture is quenched at room temperature with a 5% aqueous NaHCO3 solution, stirred for 15 min, and the resulting mixture is extracted twice using CH2Cl2 . The organic phases are combined, dried over MgSO4 and filtered. Solvents are evaporated and the resulting crude material is purified by standard methods. To a cold solution of substrate (1.0 mmol) and DBU (1.5 mmol) in CH2Cl2 (3.0 ml) is added XtalFluor-E ®or XtalFluor-M® (1.5 mmol). After 30 min of stirring under nitrogen, the reaction mixture is allowed to warm to room temperature. Upon reaction completion, the reaction mixture is quenched with a 5% aqueous NaHCO3 solution, stirred for 15 min, and the resulting mixture is extracted twice using CH2Cl2. The organic phases are combined, dried over MgSO4 and filtered. Solvents are evaporated and the resulting crude material is purified by standard methods. 3HF∙TEA is a good place to start (Procedure A). If conversion is problematic, 2HF∙TEA is a more reactive promoter (Procedure B). If 3HF∙TEA provides less elimination by-product than 2HF∙TEA but fails to complete, then use 3HF∙TEA in refluxing DCE (Procedure C). DBU is a good promoter for acid-sensitive substrates and works only for hydroxyls such as alcohols and carboxylic acids (Procedure D).